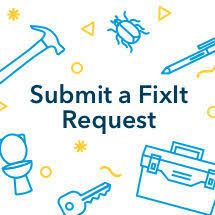 Submit your maintenance issue through FixIt, our on-line maintenance portal. Emergency requests should be called into Facilities Central at 202-994-6706 option 2. Division of Operation's Facilities and Campus Development under the Executive Vice President and Chief Financial Officer's portfolio, builds, manages and maintains GW's property and grounds on all three of GW's campuses. This includes construction management, capital planning, campus planning, housekeeping, routine and emergency maintenance, moving services, pest control, project management, life safety upkeep, HVAC repairs, grounds maintenance, and recycling/waste management. Our maintenance team includes electricians, carpenters, painters, HVAC technicians, locksmiths, and plumbers. Other teammembers include Project Managers, Engineers, Property Managers and Work Control staff.